Sunday Wasn't a "Duty" for Lily! Nearly 13,000 kilometers from here, in the city of Chennai, stands the beautiful church of St. Joseph. It is a picturesque building of a distinctive design. It was Father Xavier’s pride and joy. Many times he spoke to me with great pride about that church, which he and his parishioners built with more love than money. We might call St. Joseph’s church Father Xavier’s monument. But we’d be wrong. If you’re looking for his monument, look around you. Look around you in the church this morning. Look at the parishioners—young and old—of Christ the Redeemer, whose lives he touched with his simplicity and gentleness. Looking at this congregation I can almost feel the beating heart of our parish family. Look at his fellow Pallottine priests, confreres in the religious community he served as a formator and a promoter of missions. And see the diocesan priests, from the North Shore and elsewhere, who valued his fraternal warmth. We even welcome representatives from Sacred Heart Parish in Terrace, where his passing has already been commemorated last week at Mass celebrated in a full church by the Bishop of Prince George. Here is the true monument—the true memorial—of a priest who lived the Beatitudes with grace and conviction. This living monument, of course, of flesh and blood, is earthly while the reward of his labours—as Jesus has just told us in the Gospel—is in heaven. We hear the Beatitudes read fairly often at funerals, but today they strike us with a particular force. 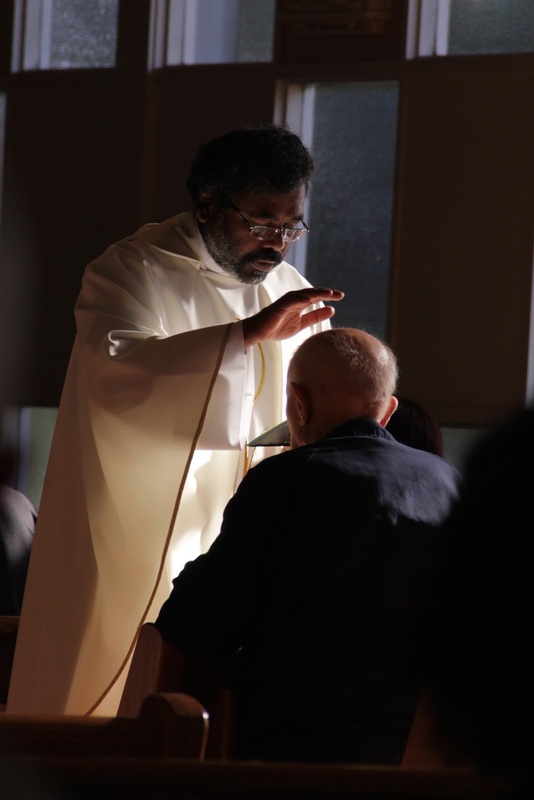 In the first place, although Father Xavier was legitimately proud of his accomplishments both in India and in Canada, he had a purity of heart and a poverty of spirit that always gave the due credit to God. A priest can preach effectively about virtues like charity or patience but the only homily he can really give on purity of heart and poverty of spirit is the witness of his life. We also heard Jesus say “Blessed are the meek, for they will inherit the earth.” Now I suspect there were Pallottine seminarians who didn’t think their prefect was particularly meek, but in his parish ministry he was unfailingly humble and gentle and kind. And his meekness was the specifically Christian variety, not to be confused with being obsequious or unassertive. One day a large trailer pulled into the parking lot carrying a cow as an educational experience for our students at St. Anthony’s school–a bunch of city kids. Being a city kid myself, I ran back to the rectory and I urged Father Xavier to come over to the school to see the cow. I promptly interrupted him from the chair, to exclaim “Father Xavier and I never fought”—which is more than I can say about Father Giovanni! Although all the Beatitudes fit this peaceful and righteous man, the one he was called to live most fully was “Blessed are they who mourn, for they will be comforted.” The tragic death of his sister Nirmala Maria, a young religious who had just finished her training as a surgeon, was his own moment to join Jesus on the Cross. It was, I believe, the time when he lived Christ’s priesthood most fully. But he did offer Mass. He did find the spiritual strength to believe that those who mourn will be comforted. He did find the courage not to grieve as those who have no hope. He was able, along with the rest of his heartbroken family, to move through that darkness with faith in the Resurrection of Jesus and in the resurrection of those who have died in Christ. Of course we are here today to pray for the repose of his soul, but if I can ask one thing of you this morning it is this: do pray especially for his mother, who has had to face two such terrible losses. Today, as the first reading says, is our time to mourn. But it is also our time to embrace—to embrace one another and to embrace the consoling and encouraging word of God. It is what Father Xavier himself did and it is what he would have us do.